Romhacking.net - Review - Decent hack! A little hack of Final Mission. 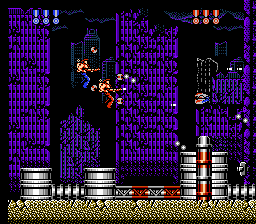 Modified palette and character sprites (partially taken from Super Contra X). This patch will work with the Stardust Crusaders translation, provided that this patch is applied first. This is a very cool concept. 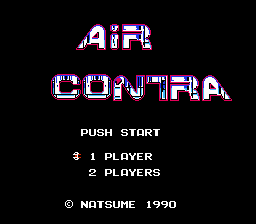 I like the name Air Contra, definitely makes a better version of S.C.A.T. Definitely feels like a Contra sequel that would have happened back in the day had Konami decided to go a different route with the series. Maybe they should have teamed up with Natsume and made this happen instead!! However, I do have a wish list of sorts for the guys who created this. While using the Japanese version was probably much easier than the American or European versions, it would have been cool to port the English dialogue from the American version to flesh out the translation. It would have also been cool to come up with a storyline/plot to tie-in with the Contra series with a return of Red Falcon or something along those lines. 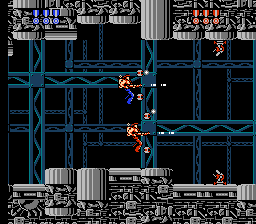 Another small gripe, I would have rather they utilized the increased power bar from the American release, as the 3 hit Japanese version makes the game pretty tough. Overall, I definitely recommend this. The complaints are very minor, and like I said, maybe we can see those improvements in future updates to this nicely thought out hack. Well done!